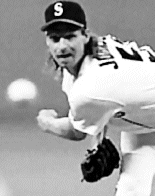 Pittsburgh - OK, it was pseudo-ace Randy Johnson's game, but you always hope this will be the game he turns the corner - and just maybe it was. The Unit's line does not look all that impressive: 3 runs allowed in 7 innings, but he pitched out of a bases loaded, none out jam in the second that in the past had usually led to a big inning, allowing just a single run. Other than that, the only scoring was done on an Alex Rodriguez bomb deep to left in the sixth. He can hardly be taken to task for that. Randy allowed just four base hits and a walk in seven innings, and there were the eleven punch outs as well. So there were signs of life in his left arm, finally. Pirates fans are crossing their fingers. But not more so than they were in the bottom of the ninth. The score was 3-2, Royales, in the bottom the ninth. Doug Jones, master of the slow and even slower changeup, was on the mound for the Montreal Nine. The Pirates had been running on Mike Piazza whenever possible, so he had a new battery mate in Masaaki Mori, the defensive specialist who possess a gun for a right arm. Well, Johnny Mize and Chino Smith worked the counts against Jones, but were ultimately disposed without too much trouble from the changeup artist. Then to the dish strode Gabby Hartnett, the Bucs receiver. Gabby has not been sensational at said dish for the Pittsburghers, although behind it he's been deadly for opposing baserunners. But don't doubt it, Gabby can indeed swing the lumber a bit, too. It wasn't exactly "The Homer In The Gloamin'", but Mr. Hartnett connected on a 2-0 changeup - what else - and deposited it way back in the cheap seats, tying the game at three. The Pirates, who have made a habit of coming back late in games, had done it again. Billy Francis, known to take a pitch in the sleeve with the best of them, did just that after Gabby's blast, but the rally ended there when pinch hitter Max Carey grounded out. Troy Percival, exposed a little of late, if you can call getting scored upon being exposed, came on for the Bucs and set aside the Royales on 10 pitches in the top of the tenth. Nap Rucker came on for the Royales in the bottom of the frame and got Henry Kimbro easily enough before Pop Lloyd came up. 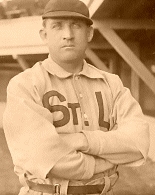 John Henry grounded was seemed to all in the park like out number two toward slick second sacker Joe Gordon. Unfortunately for the Canadian club, Joe booted the ball away and J.H. Lloyd was aboard bag number one. This brought up Superman, uh, excuse me, Jesse Burkett. He only seems like Superman because of his .440 average with the Pirates club (.377 overall). Jesse didn't disappoint either, launching a game winning triple to the deepest part of center field as Pop scored the game winner and the Pittsburgh fans celebrated an unlikely comeback win - again. Temperature: 77, Sky: threatening, Wind: in from center at 4 MPH.